The only negative con of L-shaped kitchen is that it is not suitable for elongated narrow space; square kitchen is ideal. 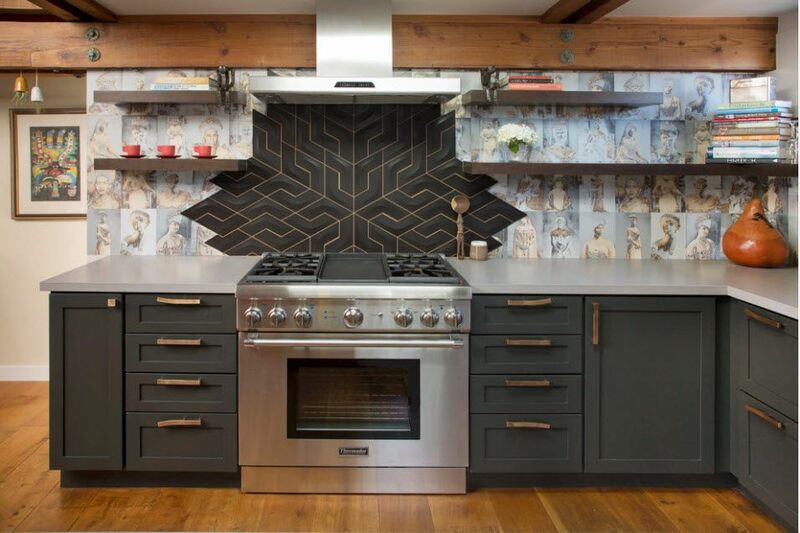 The main elements of any kitchen are stove, sink and refrigerator. They are set at a certain distance, forming a kitchen triangle, with washing part (sink and dishwasher) is in the middle, and a stove with refrigerator are at maximum distance from each other. If the kitchen is big enough, the distance between the stove and the sink is better to reduce in order to have more comfort access to the main kitchen appliances. The equipment is complemented by the work area countertops, cabinets for products with a long shelf life (cereals, pasta, sugar, tea, and so on) and items of kitchen utensils, for dishes drying. Cabinets are used both floor-stand and hanging. There are also can be placed various household appliances here. 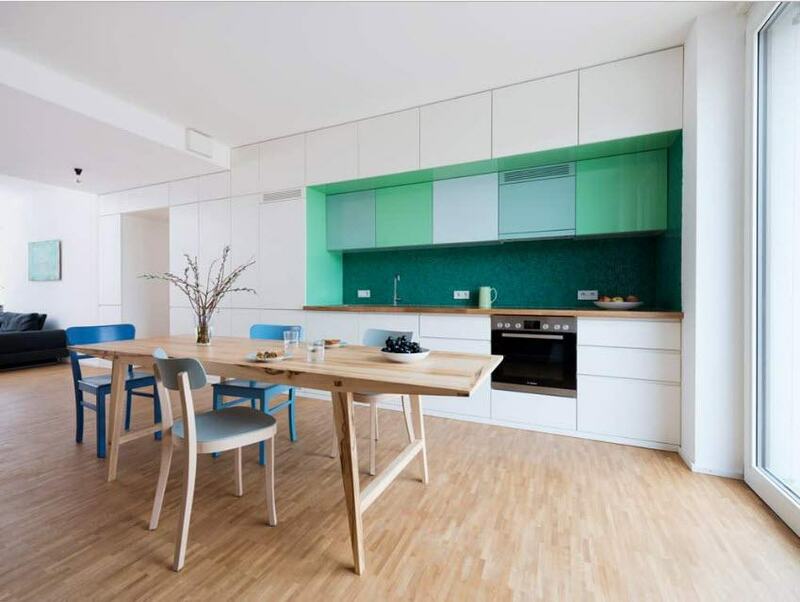 It is recommended to use open wall shelves or cabinets with transparent doors for small kitchens. This enlarges the space, creates a sense of lightness. It is very important to equip the angle. Here you can locate a special corner sink. Convenient and fairly common option is to use a large, floor-to-ceiling corner cabinet. It can accommodate a large number of products and dishes, ensuring the release of space by reducing the number of small cabinets and shelves. Corner cabinet can have a beveled door, which also visually enlarge the free area. It is undesirable to install a plate into a corner. Two walls will become dirty at once during cooking, which will require extra effort to clean up the kitchen. Oven and microwave better to be set at a certain height so that you can monitor the cooking process without stooping. One wing of the L-shaped kitchen can be placed along the wall with a window. 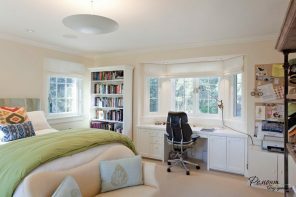 Location at the window will ensure that the working surface has enough of natural light in the daytime, which is important for the hostess. If space allows, it is desirable to have two working surfaces: between the fridge and the sink and between the sink and the stove. This makes it much more comfortable to work in the kitchen. Particular attention should be paid to the material of working surface. It should be durable, moisture resistant, smooth, without joints. Equipping the work area you should take care of high-quality lighting of all its parts. If natural and the top light is not enough, the problem can be solved with the help of built-in or wall lights. L-shaped arrangement of the work area divides the kitchen on two different areas itself. Two walls remain unoccupied. Kitchen sofa with dining table can be placed along them. It is quite popular to use bar counters. In a small kitchen the bar counter can be a table which can accommodate up to 2-3 people at the same time. Emphasize the difference between the zones using the flooring. Thus, the floor of working area can be arranged with ceramic tiles, which is easily purified from various types of contamination. Floor of the dining area is more suitable to cover with linoleum, laminate or wood. 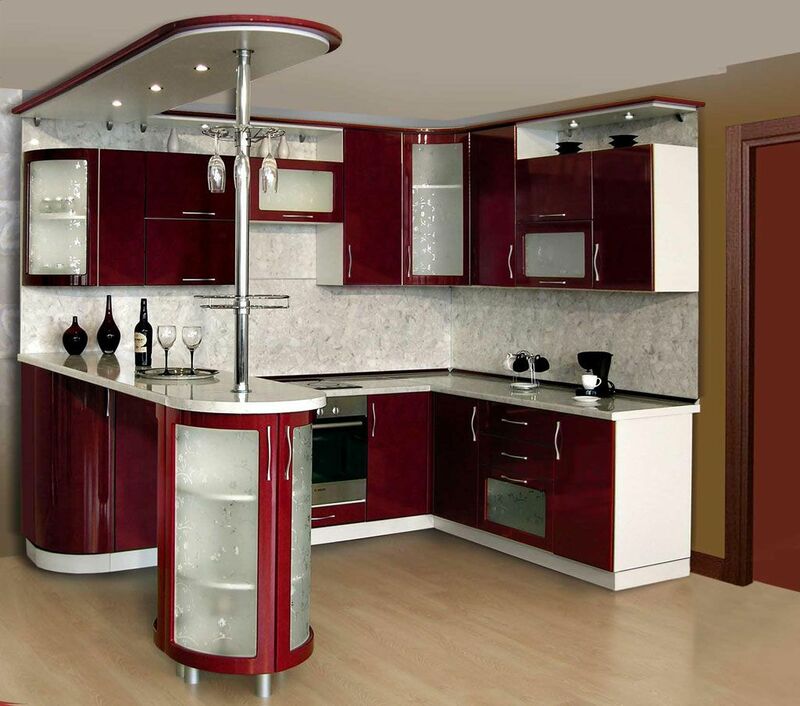 Furniture for L-shaped kitchen can be made of various materials. Furniture stores offer a wide range of solutions for kitchen these days. When choosing, it is important to remember that all pieces of furniture should match each other and constitute a harmonious interior.